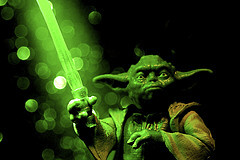 All content marketers can learn from what Yoda said to a young Anakin Skywalker: “Fear is the path to the dark side. Fear leads to anger. Anger leads to hate. Hate leads to suffering.” This very same destructive sequence, which turned Anakin into Darth Vader, all too frequently derails content marketing efforts. Why? Because, horror of horrors, content marketing involves a large amount of writing, and for many people, writing is terrifying (they may say they hate writing, but thanks to Yoda, we know they’re just scared). Even worse, someone has to gingerly edit that writing without hurting psyches already fragile from the writing struggle. Particularly for content marketing campaigns that involve a lot of blogging, the fear and hatred of writing can cause complete content marketing paralysis. Don’t think too hard as you write your first draft, or you’ll be in for a nasty case of writer’s block. Think as if you were in a lightsaber battle. You can’t form your fighting strategy as you slash or you’ll be cut in half. Take the advice in this post into account before you write, and use it to edit your work after you write. Do not let it paralyze you while you write. Your blog posts may not always be intense as a Jedi using the Force, but you must focus on one key idea to catch and hold the attention of your readers. You can make several points as part of one idea, but readers should have a clear idea of what they’re supposed to take away from reading your post. Now, you may get halfway through writing a post when you realize that your focus is different from the one you intended. That’s fine, and common. When you’re done with your first draft, just go back and make any necessary edits to pivot the whole post toward this new focus. Just as a Jedi would speak very differently to a fellow Jedi than to Jar-Jar Binx, you need to determine which audience your post is addressing and choose your vocabulary accordingly. There’s no need to oversimplify terms for a highly technical audience. But if your company has to educate prospects who aren’t familiar with your industry, using too much industry speak will work against you. Just as Jedi Knights live efficient, graceful lives, you should keep your language as concise and elegant as possible. Strong, clean writing makes your points more effective. Han Solo wasn’t a Jedi, but he still played a huge role in bringing balance back to the Force. The same goes for writing. While you should always put forth your best effort, you don’t have to be Hemingway or Poe. As long as your ideas are strong and you write clearly, your content will excel. In content marketing, an excellent idea is better than a poetic sentence. Jedi can get away with covert persuasion, but you shouldn’t hedge around self promotional content. Your readers will see right through it. In most cases, it’s better to admit that you’re drawing from personal experience to create this valuable content than to talk about “a service” when you really mean your service. I recently had the pleasure of speaking to…. Those would be fine starts to a second or third sentence, or even the second paragraph, but they shouldn’t start your whole post because they don’t immediately provide an incentive to keep reading. When a Jedi wants something he gets it. So figure out what action you want your readers to take—an email subscription, a Facebook like, a comment—and ask for it. Be careful, though, not to ask for something bigger than your audience is ready to give, or you risk losing their trust. For example, direct readers to a white paper they can register to download and follow up with a friendly email instead of asking readers to pick up the phone to contact your sales team. Don’t be afraid to involve your passions and your sense of humor into your blogging effort no matter how serious and wise you think your target audience is. Even Yoda laughed sometimes, and he had Darth Vader to reckon with. What tips and guidelines help dispel your content marketing team’s fear and suffering? Comment with your ideas and additions below, and, of course, may the Force be with you.